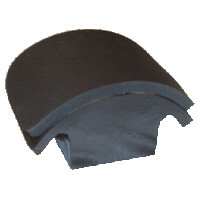 This 3½"x6½" medium (Euro) curved cap form replacement is fit for the Geo Knight DK7, DK7T, & DC-CAP heat presses. The George Knight cap heat presses are designed with interchangable curved cap forms for working with different sized hats and caps. They are easily replaceable and come in three sizes to fit your needs.